The country’s biggest automobile festival, the Auto Expo, is all set to begin this Wednesday. This biennial Expo, is unlike the previous ones, as manufacturers are being nudged to shift to zero emission vehicles (read electric) amidst rising concerns related to air pollution and energy security. Companies have therefore lined up several electric vehicles (EVs) — cars, two-wheelers and commercial vehicles. The Expo will open for the public on February 9 and conclude on February 14. The Expo is also marked by an absence of leading global carmakers — Volkswagen, Nissan, Ford and GM (which exited the Indian market last year). Companies like Bajaj Auto and Royal Enfield, which did not participate in the previous Expo, continue to stay away from it. Korean carmaker Kia will mark its first attendance as it readies to enter the domestic market next year. In a way, the Expo has always been a reflection of what the policymakers want the domestic industry to follow. And, this year will be no different. Besides launches of completely new models that will be powered by regular combustion engines, electric-powered and green technology vehicles will be an all-pervasive theme of this year. Maruti Suzuki, the country’s biggest carmaker, will showcase its first concept electric vehicle, the e-SURVIVOR. The company said this concept symbolised Maruti Suzuki’s commitment to help develop the entire lifecycle of EVs in India, including local manufacture of components, charging infrastructure and recycling of batteries. Besides this, the company will also showcase a working model of the hybrid vehicle system. Though the government has indicated a preference for electric vehicles, the company believes hybrid technology can reduce emission and fuel consumption in vehicles not addressed by EVs. Its nearest rival, Hyundai, is displaying the Ioniq electric vehicle. A hybrid variant of the Ioniq is also going to be on display. 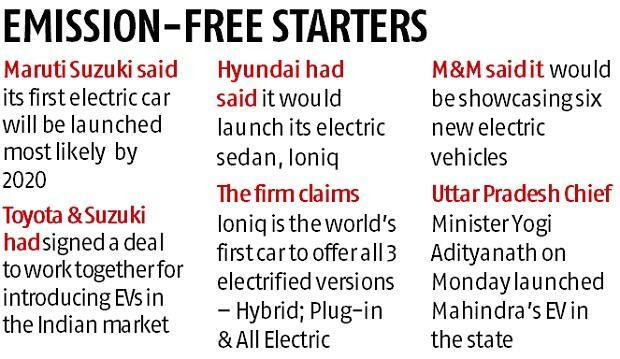 The company plans to introduce an electric car in the Indian market next year (imported as a completely knocked-down unit) to test the readiness and acceptability among buyers. 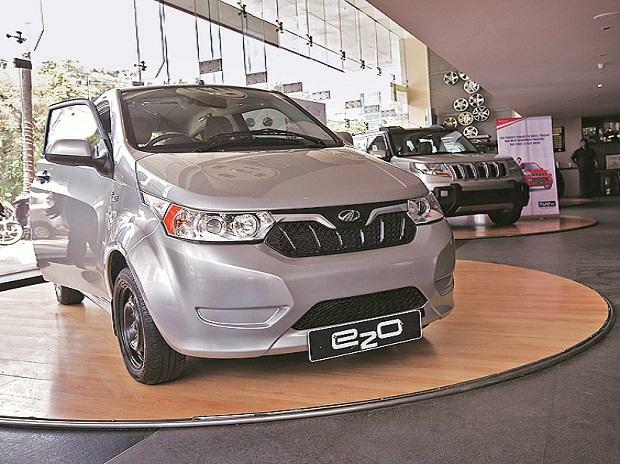 Homegrown automobile major Mahindra & Mahindra plans to showcase six new EVs, including two futuristic concepts. The company has a first mover advantage in electric cars. “We will display the widest range of electric passenger and mass mobility solutions including inspiring concepts, electric mobility platforms and future electric architecture that will manifest our commitment towards sustainable mobility in India,” said Rajan Wadhera, president (automotive), M&M. The government has indicated an ambition to electrify all vehicles in the country by 2030. Tata Motors is also expected to showcase electric passenger and commercial vehicles (CV). CV major Ashok Leyland will also showcase electric buses. ALSO READ: Auto Expo 2018: Big brands opt out; is the biennial show losing its mojo? But, the electric mobility ambitions are not limited to four-wheelers. Two-wheeler makers are also gearing to showcase their capabilities in electric mobility. Japanese automobile major Honda, the second biggest player in the domestic two-wheeler market, will showcase an electric vehicle (EV) concept – the PCX Electric scooter. TVS Motor Company is also expected to showcase electric two-wheelers. Besides these bigger players, a number of start-ups are also ready to showcase their innovations in electric mobility. A total of 12 start-ups are exhibiting at the Expo, compared to only two in the 2016 edition. A total of 106 new vehicles will be unveiled at the Expo. This Expo, like most, will have a star-studded presence. Hyundai’s brand ambassador and Bollywood star Shah Rukh Khan, cricketing legend Sachin Tendulkar (also BMW’s brand ambassador), and actor Akshay Kumar (brand ambassador for Honda2Wheelers), among others, will grace the Expo on certain days. Amidst all this glamour, the cautiousness of many players is visible. Sectoral body Siam said the number of vehicle exhibitors was down to 51 this time against 59 in 2016 even though the total number of exhibitors was up to 100 from 88 in the previous Expo. “The Expo is not a cheap thing to do,” said Abhay Firodia, president, Siam, and chairman of Pune-headquartered Force Motors. “Companies that participate look at costs as an investment in branding and building relationship with stakeholders,” he added. Siam said the rental cost of space at the Expo formed just 15-20 per cent of the total cost and this had not gone up compared to the previous edition. The other costs relate to investment in setting up large designer stalls, bringing products, getting manpower, etc. An executive at a leading car maker said it was spending ~250-300 million in participating at the Expo. Firms like Nissan, Volkswagen and Ford struggle with their low-single digit share in Indian car market and it makes little sense for them to invest big bucks. When asked about the cost benefit analysis of participating in Expo, Maruti Suzuki's managing director and chief executive officer Kenichi Ayukawa said the Expo provided a big platform to appeal to customers and connect with them. “That is why we join…of course, it would have been better if costs were lower. But, if we don’t encourage these kinds of activities, who will? In a sense, it is a festival…people enjoy…it leaves a good memory,” he said.